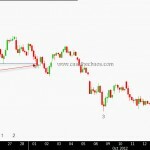 Apple dropped below 623.55 on Friday and that marked a 5 wave decline on a small degree. 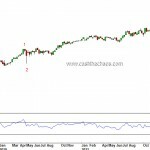 We know that when a market declines in 5 waves it normally happens to be a part of a bigger move. With that in mind, let us look at the bigger picture - the real big picture. As shown in the monthly charts below, it is possible to count 5 waves from the 1997 low. And at the top of wave 5 a clear drop in momentum readings - a disagreement between price and momentum. Wave 3 on the monthly charts saw a 6 fold increase and wave 5 was little over 3 times wave 1 through 3. The real kicker though is not the price relationship but the time relationship. Wave 3 was 2months longer than 1.618 times wave 1; Wave 4 and wave 2 have a perfect 0.382 Fibonacci relationship; and wave 5 is 0.78 times wave 3!!! Let us zoom in little more closer - the weekly charts. The 5th wave starting from the 2009 low can be interpreted in a couple of ways. My interpretation is that the first wave within the 5th was extended. In that case we have a perfect ending relationship - Waves 3+5 are 0.382 times extended wave 1. 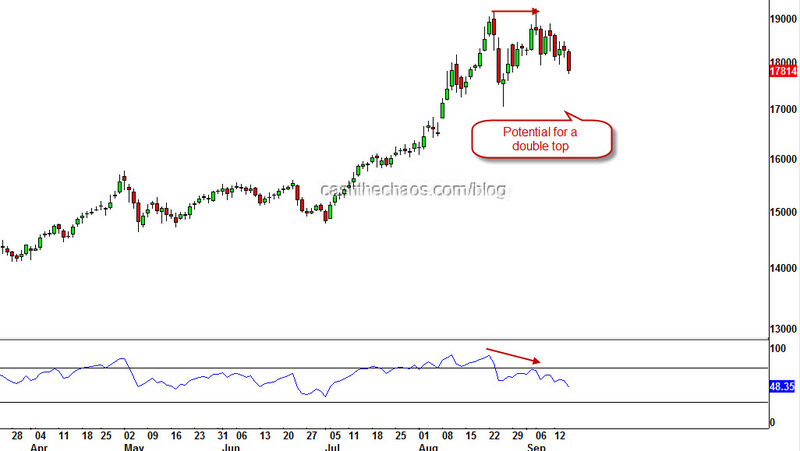 The momentum divergence here is more pronounced than on the monthly charts. 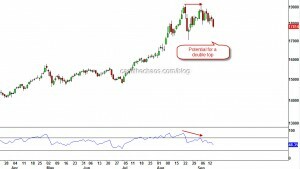 So there is a good chance that the top 705 was a wave 5 top. Seeing the above evidence, I lean towards the possibility that AAPL has seen a MASSIVE TOP, a 5th of a 5th. If I'm right, we are possibly looking at AAPL declining to $80 in the next 3-4 years. 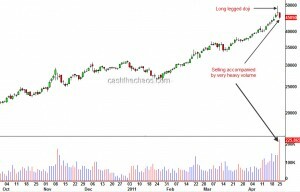 Either AAPL will burn cash or competition will crush AAPL or some other form of roadblock could be the reason but we are not bothered about the reasons. Reasons will come later. Think such a decline is not possible? Think Nortel, Juniper, Himachal Futuristic, Satyam to name a few. 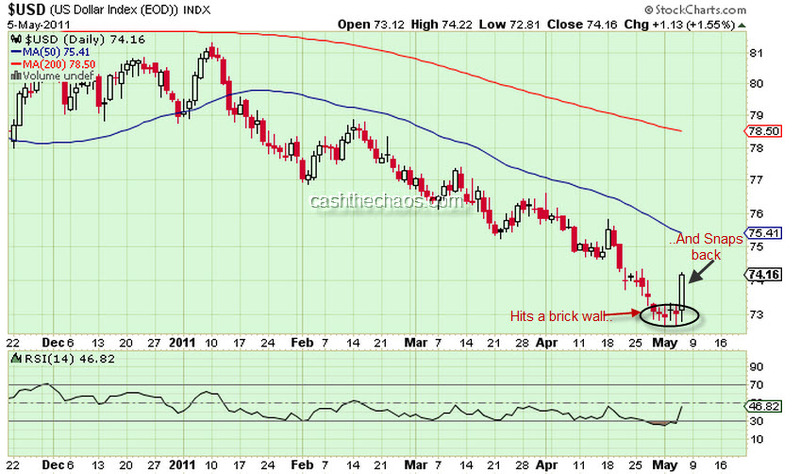 Short term: Apple could bounce from sub 600 to 650-674, if it does, I think it will be a low risk selling opportunity. The broader implication if this analysis is correct - the world is up for some nasty months. Disclosure: I'm short Apple. I own a couple of Iphones and an Ipad and I will be Queuing up for Apple's mini Ipad. The Baltic Dry Index has been dropping continuously for the last 31 sessions. The index just broke through the 2008 low and this is worst reading on this index for the last two and a half decades. If you are wondering why should this be of any significance - the index is a very important measure of the health of global economy. You could either believe the commentators who are saying that we are seeing rally in equity markets because Europe is "close to being solved" (when Maths 101 tells us its impossible) or pay attention to the warning signal from this index and stay cautious and try to be safe. 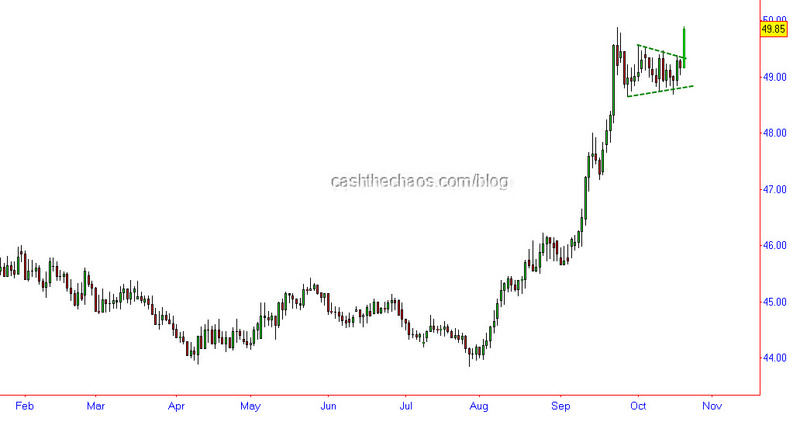 The regulars of this blog would recall my August post on the USDINR cross rates. Within that larger picture, the short-term is moving to the next stage. A narrow consolidation after a powerful move and a wide range bar. The next stage of Rupee weakness is here. The Indian currency realised its triple bottom potential at the 43.85 level as the currency moved past 46 against the USD yesterday. The chart below shows the one year daily price movements of the currency and the bottoms are marked by the red oval. The price objective of the triple bottom pattern works out to a little over 48. Given that the stock markets are oversold and a bounce may come through for Indian stocks, INR could see a short-term pull back. In 2008, when INR closed above the "cloud", the Rupee weakness lasted several months until it peaked at the level of 52.18. If we look at the movements of the INR from an Elliott wave perspective - it does look like USD/INR is in it's early stages of its powerful wave 3. The triple bottom low of 43.85 is just a shade over the 62% fibonacci retracement level of the move from the 2008 lows to the March 2009 high. This is a very common wave relationship. Now comes the staggering bit - if my wave labelling is correct, the potential for the Rupee over the next several months, works out to at least a little over 57 and a typical wave 3 relationship would take the rupee to a level of 65!!!! So there it is, another asset class that is closely related to the Indian stock market's price movements, reiterating the bearish case for India. Silver's sharp decline after hitting a multi-decade high warrants close attention. 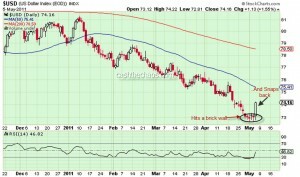 The daily chart of silver above marks the "long-legged doji" which is a key warning of sign of an impending reversal. Moreover this pattern (a) has occurred after a prolonged and parabolic rise in silver (b) has seen follow through selling on very heavy volumes and (c) has faced resistance at the 1980 highs. These are mouth-watering signs for much lower prices for silver. However I will probe this set up with a very small short trade - the Dollar Index has shown no signs of reversal and is merely consolidating near the lows. Unless the green-back turns up this might turn out to be just a fleeting drop in an up-trend.